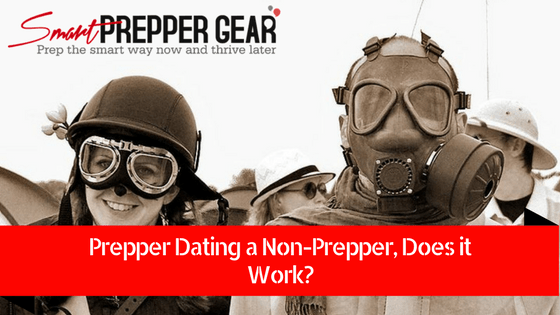 Home » Preparedness Planning » Prepper Dating a Non-Prepper, Does it Work? Prepper Dating a Non-Prepper, Does it Work? If men are from Mars and women are from Venus then preppers are from a completely different galaxy. Prepper dating is something that a lot of single preppers struggle with. This is especially true as you as you get older. Finding a good date requires some chemistry. This is hard to find since our society doesn’t really have a preparedness mindset. Most people these days are thinking about getting big houses, fancy cars, and fashionable clothing. On the other hand, preppers are thinking about beans, bullets, and bullion. For the last few years, I have been a single prepper dating non-preppers because it is hard to find local preppers. I don’t prefer long-distance relationships because of the hard work that would be required to keep it going. As a result, I have had few bad dates. One recent example is that I took a young lady out on a date at a local restaurant. We began to get to know each other. The young lady asked me what I like to do for fun. So I mentioned that I like going to the gun range to practice my accuracy. She immediately got up without saying anything and walked away. I guess she was offended to find out that I am a legal gun owner. Little did she know that I am much more than that. Then a couple of months ago I met a nice young lady. We have got to know each other. I was kind of skeptical how this would play out knowing that I am prepper dating a non-prepper. To my surprise, she has been open to lifestyle and things have been going great. As a result, I have learned a few things that I wanted to share about prepper dating. Relationships take a lot of work. There is a lack of understanding in our society when it comes to love. Many assume if you love someone then it is going to be easy and that there wouldn’t be any work and sacrifice required. That couldn’t be further from the truth. Everyone is uniquely born with differences in personality and way of life. So there is going to be head butting and a lot of difference of opinions. However, if you can recognize those differences and be willing to compromise then the relationship can go a long way. Now, there should be things that you are not willing to compromise on. Such things include your values and morals. Then there are pet-peeves that you just can’t stand no matter how much compromising that you try. Finally, you have things that you must have in a mate and shouldn’t settle for less. So when it comes to prepper dating I recommend putting together a list of can’t stand and must-haves. You should have 10 each. These 10 should things that you absolutely cannot compromise on or you know that you wouldn’t be able to sacrifice. For example, one of my biggest pet-peeve is people that smack their lips while eating. This drives me crazy to the point I wish somebody would just medicate me so that I don’t have to hear that foolishness. Then there are values that you must have in a partner. One of my must-haves is someone with a positive attitude. We all get down and go through our struggles but we can’t live with a negative mindset because it will affect the way that we live. It will also affect the people that you are close to. So this is an absolute must have. You can find some additional information about this in a book called Date or Soul Mate? by Neil Clark. I’ve learned that as a prepper dating a non-prepper most people have not been exposed to a preparedness way of life. As a prepper, we automatically assume that people will think that we are nuts if we were exposed as a prepper. However, I was pleasantly surprised to find that the woman that I have been dating is open to the lifestyle and willing to learn certain things. Now, you don’t want to just throw out your preparedness lifestyle on your partner as soon as you begin dating. You should just continue to live your life and let your actions stand out. Eventually, they will begin to take notice and understand why you do the things that you do. Many times as a prepper we can go on a full blown tangent while wearing a tin-foil hat talking about conspiracies explaining why you are a prepper. This automatically brings up red flags up in someone’s mind that you are crazy person causing them to flee for safer ground. You don’t want to get involved with someone that is totally against the preparedness lifestyle. This would be a nightmare trying to secretly live a life as a prepper without telling your partner. I have heard of married people who became a prepper after marriage explain how rough it is to be fully prepared because their spouse isn’t on board or understanding. At the same time, you need to be understanding that your dating partner is not going to become a full-blown prepper overnight. There is no guarantee that the person will ever become a prepper. However, if you are both understanding and willing to make it work then the relationship can go a long way. Altogether these would be my tips on a prepper dating a non-prepper. If you have any feedback or suggestions then please leave a comment below. Your feedback helps the community to prepare the smart way now so that we can thrive later.